Dice pumpkin and onions. Place in large pot suitable for the stove. Allow to cool and whisk. Add coconut cream. Warm through and serve. Enjoy. 33 members have added this recipe to their cookbook. Divided recipe into 10 servings and put into plastic bags, then froze them. Instant nutrition on the go. Just take a bag out of the freezer, put into container, once defrosted, heat and eat. I used sistema mugs. 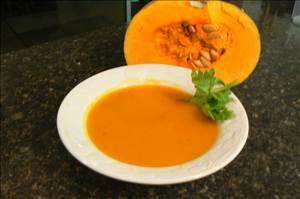 There are 58 calories in 1 serving of Thai Pumpkin Soup. Calorie Breakdown: 29% fat, 63% carbs, 8% prot.